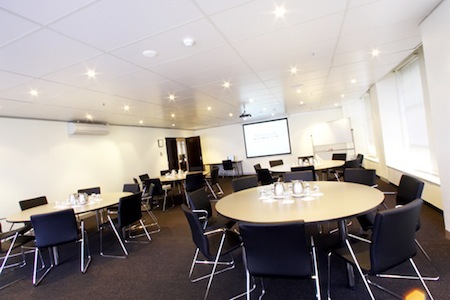 The Holmesglen Conference Centre has a range of meeting and exhibition spaces that enable us to cater for a variety of events and functions, located within 15 minutes of the central business district, at the Chadstone campus of Holmesglen. Rooms vary in size from small syndicate rooms with a capacity of six people, to an Auditorium with seating for up to 150 people. The foyer to the main Conference Centre building is a dynamic hub of activity. Extending to the outdoor courtyard, it is used by clients as a lounge area for coffee breaks and for networking with drinks at the conclusion of conferences. The addition of the Corporate Suites to the Conference Centre facilities has given us the flexibility to offer a range of modern spaces in a high-tech environment. 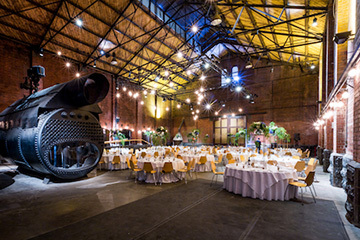 The auditorium seats 150 people in tiered rows with a full suite of audio-visual equipment available including large screen, data video projector and variable lighting, enabling a full cinematic experience. With well maintained facilities, high quality equipment and a range of catering options and licensed beverage selection, we offer the complete conference and meeting solution. The following equipment is included in the room hire charge: Whiteboard; Overhead projector; Screen; Video player and monitor; Flipchart; Electronic lectern; PA system; Data video projector. Additional equipment available at cost.